Students who fail to adhere to the procedures outlined in this Medical Student Honor Code will be referred to the Associate Dean of Student Affairs for additional investigation and determination of whether the matter warrants referral for adjudication to the Medical Student Honors Council, the Student Promotions Committee, or the School’s Deans’ Council. Each council/committee will provide the student alleged of violations an opportunity to appeal adverse actions, up to and including recommendations of dismissal, through due process procedures outlined in this Medical Student Policy and Procedure Guide. The heritage of a physician's social conduct emerged from acknowledged community standards dating back to the Oath of Hippocrates. A critical aspect of medical students' professional development is to assign one's self to a life guided by a code of ethics, endorsing a commitment to moral, ethical, and professional fidelity. Therefore, all students of the School are expected to pledge their allegiance to upholding a professional honor code (see Professionalism Policy). 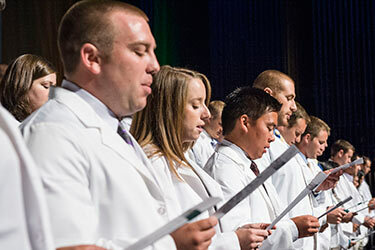 This honor code was designed to foster a culture of personal integrity, collaborative teamwork, and intellectual development during students' quest to become licensed doctors of medicine. The student will recite and sign the medical student honor code pledge. This signed pledge documents students’ commitment to the values, attitudes, and behaviors that are fundamental to medical professionalism and will become a permanent part of the student's academic file. The student will read, understand and adhere to the Wright State University Boonshoft School of Medicine Medical Student Policy and Procedure Guide that addresses attributes of professionalism. The student must adhere to all established federal, state, and local laws and follow all regulations established by Wright State University and the affiliated institutions. The student will treat patients with respect without regard to race, personal beliefs, religion, ethnicity, gender, sexual orientation, socioeconomic status, physical or mental disability, and any other discriminating factor. The student will use mature judgment when addressing honor code violations or other concerns. I publicly acknowledge and accept the privileges and responsibilities given to me today as a physician in training and dedicate myself to provide care to those in need. I will approach all aspects of my education with honesty and integrity, embracing opportunities to learn from patients, teachers, and colleagues. I will value and respect the knowledge and wisdom of the physicians who have preceded me. I will maintain the highest standards of professional conduct academically, clinically, and socially. I will certify only that which I have personally verified, and I will neither receive nor give unauthorized assistance on examinations. I will recognize my weaknesses and strengths and strive to develop those qualities that will earn the respect of my patients, my colleagues, my family, and myself. I will continue to value my relations with those who have supported me in the past and those who will share in my future. I will strive to earn the trust my patients place in me and the respect that society places upon my profession. I will respect the humanity, rights, and decisions of all patients and will attend to them with compassion and without bias, maintaining patient confidentiality, remaining tactful in my words and actions. I will value the diversity of patients’ experiences, cultures, and beliefs because it enhances my ability to care for them and enriches my education. I will remember that medicine is an art as well as a science and that warmth, sympathy, and understanding are integral to patient care. I will recognize the privileges afforded to me as a physician-in-training and promise not to abuse them. As a student I will remain aware of my responsibilities to improve the standard of health in my community, to increase access to care for the underserved, and to advance medical knowledge. By accepting these new responsibilities, I will remember the importance of my own health and well-being as well as those of my colleagues. Knowing my own limitations and those of medicine, I commit myself to a lifelong journey of learning how to cure, relieve, and comfort with humility and compassion. I make this pledge solemnly, freely, and upon my honor.